Fort Cameron (1872-1883) - First established as Camp Beaver 25 May 1872 by Major John D. Wilkins, 8th U.S. Infantry. Named Fort Cameron 30 Jun 1874 after Colonel James Cameron, 79th New York Infantry, killed 21 Jul 1861 at the battle of Bull Run during the U.S. Civil War. Abandoned 1 May 1883 and sold to the Mormon Church. Also known as Post of Beaver Canyon and Post Near Beaver City. Built of local lava stone around a quadrangle 700 by 620 feet. First garrisoned by four companies of troops in 1872. Four barracks were built, one for each company, on the east and west sides of the quadrangle. Officers quarters were built on the south side. 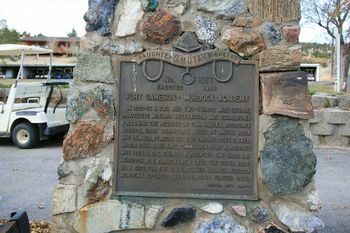 On the north side were the headquarters, commissary, and hospital. The fort was abandoned 1 May 1883 and the troops removed to Fort Douglas (1) in Salt Lake City. The property was sold to two local Mormons who donated the majority of the property to the Brigham Young University, Beaver Branch, Murdock Academy (1898-1922). When the Academy closed the buildings were razed and the grounds became a racecourse and a golf course. One single building remained as a private residence. The majority of the original post is a golf course outside of Beaver, UT. 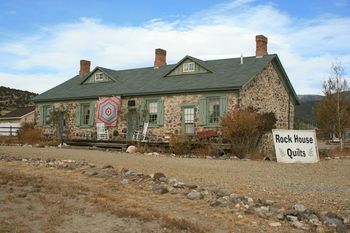 The one remaining original building was still in use as a Quilt Shop. Location: Beaver, Beaver County, Utah. This page was last modified 10:04, 17 March 2019 by Bill Thayer. Based on work by John Stanton.